My latest party for my littlest guy is based upon his love of being outside with his Daddy 24/7. He particularly loves digging! So, when I was brainstorming ideas for his birthday, I knew I wanted to do a party with an outdoor theme. He just happened to be turning three, so Dirty Third-y it was! I always like to start my parties with a welcome to the guests. That usually takes the form of some sort of door hanging. Even though all my guests know where we live, when you have guests who have never been to your home before, it's nice to indicate that this door leads to the party! I made this wreath by dismantling the one from his Twolladega party last year and adding some gummy worms and a cute little bucket cutout from my Silhouette. And, for my boys' parties, I always have a giant stair hanging! This time I made a giant 3 out of a cardboard folding science fair backdrop and added some gummy worms that I painted on cardboard and cut out. For the invitation, of COURSE I had my favorite graphics people, Piggy Bank Parties, come up with something just for Lachlan! I am so lucky to be one of the few people whom they will custom design for. We are always on the same wavelength and when I toss them a crazy party idea, they always knock it out of the park with the printables! And guess what? They've already listed the entire collection in their Etsy shop! For the backdrop, I wanted to have his name outlined in gummy worms, so I bought a huge bag of bulk gummy worms (or "yummy" worms as he calls them) and glued them to wooden letters from +Hobby Lobby . I stuck them to a large piece of brown corrugated cardboard which I cut into the shape of a big mud splatter. I found these cute shovels in the dollar spot at Target and I knew I wanted to have them hanging from the front of the table. The brilliant Purple Pug made him this fabulous table runner with his name in glitter, of course! She has made my boys something for pretty much every one of their birthdays and I have a small collection of her awesomeness in each of their rooms! I used this worm sculpture that was left over from his first "Lach Ness Monster" party for added table cuteness. He had been hanging around in our back yard for two years and I realized that he HAD to be included in this party and I painted his middle section red. Lach LOVES the oreos from Maria at Love and Sugar Kisses. So, I knew I had to get order some for him. Maria absolutely killed it with these. When I saw that she had made the bucket 3D, I might have squealed aloud. Lach's favorites were the ones with the little worms. Here is another view of the cute printables! My sister whipped up this cute little banner for the crate using some of the printables from Piggy Bank Parties. My husband's favorite dessert is dirt cake. And what kid doesn't like that? I got these cute little green metal platters from +Michaels Stores this summer and used a green stand from +Hobby Lobby to make my own two tier stand. Inside, I displayed miniature individual dirt cakes in clear cups. I was a slave driver and made my mom and sister tape the bamboo spoons onto the cups with cute orange and green washi. And, of course, there was a chocolate fountain. I served it with fruit and marshmallows, and even some more gummy worms for the sweet-tooth inclined. The kids loved it! I knew I wanted to do a chocolate cake that looked like a dirt cake, but wasn't. So, I sent Mad Lily Cakery a picture of what I was thinking. How cute is this cake? And let me tell you, it was DELICIOUS. I wish I had a piece right now! It's pretty much the perfect cake for boys. My friends at +Birthday Express sent me some awesome polka dot party supplies for this party and I blew up a bunch of balloons and put them all in my living room. The kids loved it. Simple pleasures. And yes, my kids are watching their obsession, Little Einsteins. For the savory food, we kept it simple, Little Caesars pizza and homemade pasta salad. Good for adults and kids! I made this banner for my bar with my Silhouette. 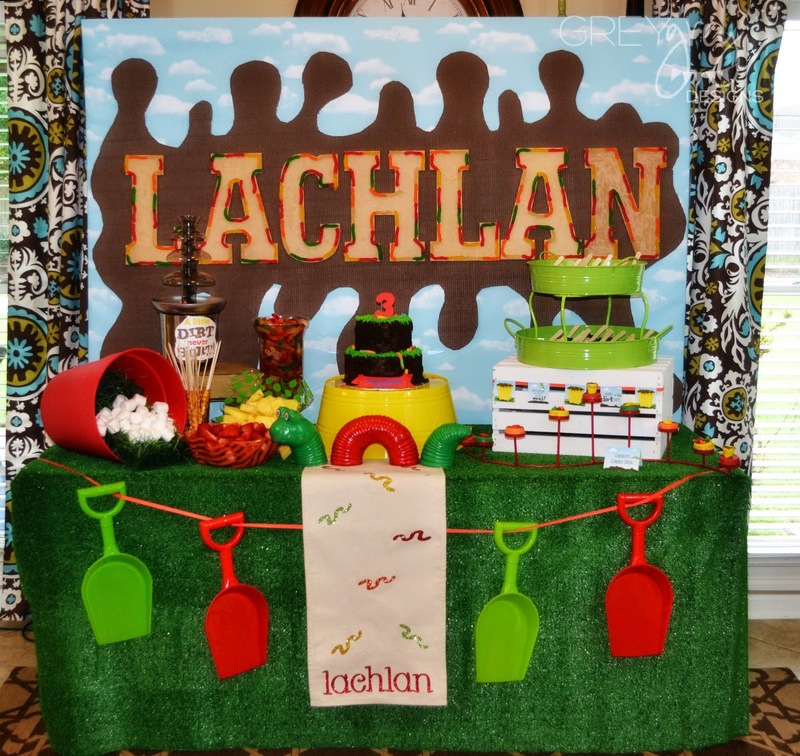 I displayed the cute party supplies from Birthday Express on my bar, along with pictures of Lach on every birthday. We almost always ask for charity donations in lieu of gifts for our kids' birthdays. They already get enough stuff from their aunts, uncles, and grandparents. Our kids have every toy that they could ever need and so many children don't. This year, on both their birthdays we asked for donations to The Confetti Foundation. We ask our guests to bring monetary donations to help other children in the hospital have birthday parties too. It teaches our kids to be charitable and it serves a need. Win-win! For the favors, I knew I wanted to do a personalized gift. Target had these cute kid-sized sand pails all summer in their dollar spot. I snapped so many of them up! So, how great is this banner? Worms? Brilliant. I found the best mud splatter graphic on the Silhouette store and cut the kids' names out of the design in brown vinyl. This is what a happy boy looks like. So, here's the story of this candle. My mother-in-law saw someone get one of these and she loved it and picked one up for each of her little grandkids. It is like a serious firework and it then rotates and sings Happy Birthday! It's a crowd-pleaser for sure! You know...real party= wet kids. Happy Birthday my sweet Lachy! We LOVE that slide! We just got it about a month ago and my kids are obsessed! It's so easy to use! This is the greatest dirty party I have seen! So many creative ideas! Love the mini dirt cakes and all the cool stuff you added with the gummy worms. Your son is adorable! Awesome job! I love how many products you found at the dollar spot - it shows you don't have to spend a lot to be super creative! I love your ideas! Talk about being behind on post! Seriously love this theme! You did a FAB job as usual lady.